In 2002, the Department of Environment and Natural Resources-Biodiversity Management Bureau (then known as the Protected Areas and Wildlife Bureau), Conservation International Philippines (CI Philippines), and the Biodiversity Conservation Program of the University of the Philippines Center for Integrative and Development Studies (BCP-UPCIDS), with support from the FPE as well as other partners and donors convened the Philippine Biodiversity Conservation Priority-setting Program (PBCPP). A gathering of 300 scientific experts and local policy-makers in the environmental sector, the convention produced five key outputs, published in the group’s Final Report entitled Philippine Biodiversity Conservation Priorities. 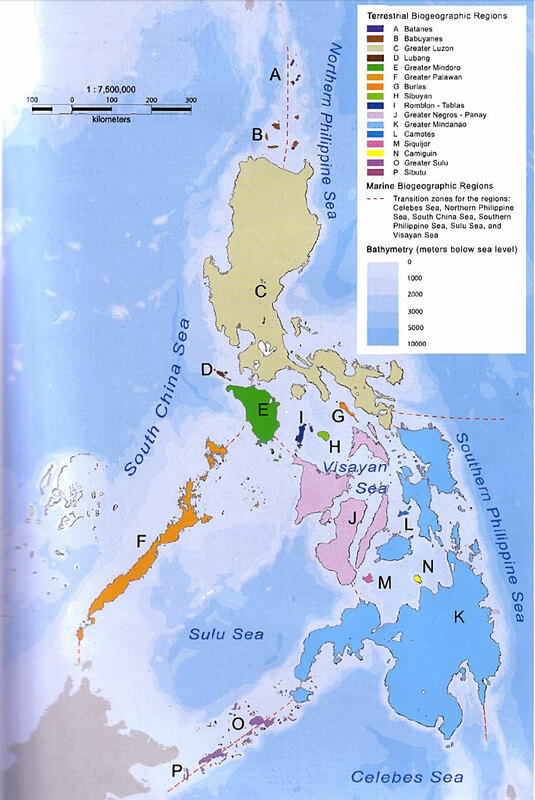 One of the highlight outputs from the said priority-setting program was the identification of the primary biogeographic regions of the country, 16 of which are terrestrial and six are marine. The terrestrial regions were identified based on the geographic distribution patterns of vascular plants, arthropods, amphibians, reptiles, birds, and mammals, while the marine zones were defined based on the connectivity and dispersal features of an ocean circulation with broad transition zones based on the evolutionary geology of the archipelago and observed associated reef fish assemblages. 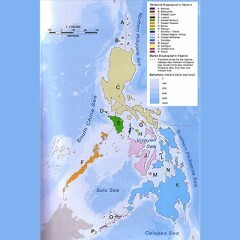 Below is a representation of the said biogeographic regions, as visualized on the Philippine map. Click the image to view the image in full resolution. To download the full report of the PBCPP, click here. Aside from the above, another visual representation of the Philippines’ biogeographic regions is provided by the ASEAN Center for Biodiversity’s Biodiversity Information Sharing Service. The interactive tool allows viewers to select and/or isolate the locally occurring ecosystems according to type. Click here to access the interactive map. Ong PS, Afuang LE, Rosell-Ambal RE (eds.). 2002. Philippine Biodiversity Conservation Priorities: A Second Iteration of the National Biodiversity Strategy and Action Plan. Quezon City, Philippines: Department of Environment and Natural Resources-Protected Areas anad Wildlife Bureau, Conservation International Philippines, Biodiversity Conservation Program-University of the Philippines Center for Integrative and Development Studies, and Foundation for the Philippine Environment.